As my book manuscript comes into shape — almost done! — I find myself referencing a stack of foraging books several feet high. Ands it happens I often get asked about my go-to foraging books. So here are a few of my favorites. The first, best and most compelling foraging book for me must be Euell Gibbons’ Stalking The Wild Asparagus, the book that got me foraging for things beyond what my family knew about. Gibbons has been an inspiration for me forever, and I’ve returned to his books over and over. He is knowledgeable, has obviously eaten everything he writes about, and most importantly, he’s traveled. This is key: The vast majority of foraging books are regional in scope, and this is not necessarily bad — in fact I have several regional guides in this post. But Gibbons’ wanderings gave him unusual authority to write from a national perspective. He did this in several other useful books, notably his Stalking The Blue-Eyed Scallop, which covers the seaside environment, as well as self-explanatory Stalking The Healthful Herbs. If you live or vacation near a seashore, you pretty much need to own Gibbons’ “Scallop,” and if you are at all interested in wild herbs as medicine or just as a nice accompaniment to your food, then the “Herbs” book is for you. The one drawback of Gibbons’ books are the images, which are nice line drawings, but are not overly helpful for the beginner. A modern forager, Samuel Thayer, has done an excellent job with the images in his self-published Nature’s Garden. This is Thayer’s second self-published book, and is the better of the two in my view. His first has a tone to it that put me off: He correctly points out that many foraging books perpetuate myths about plants because the authors have not actually seen or eaten some of the plants, but he cops a “they’re all idiots” attitude in his first book I found off-putting. Thankfully, that ‘tude is largely absent from his second book. 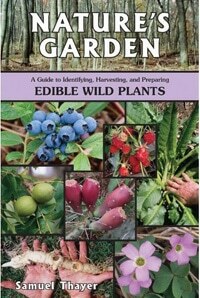 Nature’s Garden is an excellent book if you live east of the Great Plains. While there are a number of plants he discusses that are live in the West, more than half either do not or are so rare as to be pretty much unforagable. Still, for those plants Thayer writes about that do live in abundance here in California, I find his entries very thorough. For those who live West of the Great Plains, there are three books I find invaluable. First and foremost is Charlotte Bringle Clarke’s Edible and Useful Plants of California. Her book covers a lot of ground and is not as thorough as Gibbons or Thayer, but she deals with pretty much everything I see around me in California — and that comprehensiveness is valuable. I use this book, which has good pictures, as a stepping stone for further research into a plant. California, however, is an odd place (in more ways than one), and its flora is often pretty unique. 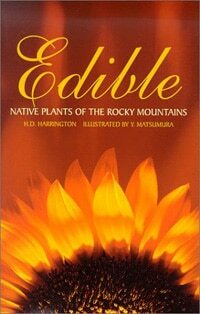 But head east into the Rocky Mountains, and there is an excellent guide, Edible Native Plants of the Rocky Mountains, which has some of the best botanical illustrations I’ve ever seen in an edible plant book. 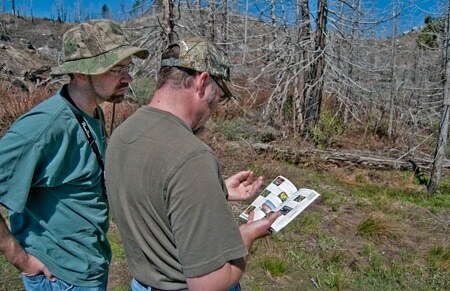 Many of the plants described also live in California, and each account is far more thorough than Clarke’s book. What’s more, the Rocky Mountain book is written by scientists who ate everything they write about and did experiments on the edibility in various preparations. If you live between Colorado and the Pacific, you should get this book. If you live further south, however, in the desert regions of California, Arizona, New Mexico or Texas, you will love Gary Paul Nabhan’s Gathering the Desert, which is a little woo-woo-juju concerning the Indians who developed all the uses for these desert plants, but which contains all sorts of useful information. Its drawback? It deals only with a few edible plants. It’s success? It deals with those plants comprehensively. I am heading to Massachusetts soon to see my mother and sister — and to go on one last foraging trip before my book is due in August. I know a lot of those plants by heart, but I have not lived in the East since 2001, so I looked for a New England-specific plant guide, and I found one in Russ Cohen’s Wild Plants I Have Known…and Eaten. Again, Cohen has what I view as a the magic ingredient for a successful foraging book — he has actually eaten everything he writes about. His book is specifically about Essex County, Massachusetts, but the plants he describes live pretty much everywhere from Maryland to Maine and west to the Ohio Valley. There are not too many isolated edible plants in the East, I’ve found. I can’t finish without a word on mushrooms. Mushroom hunting is different from other foraging in that there is more risk at work; you need to know what the hell you are doing. My guide to that — and ask any mycophile and she will agree — is the incomparable Mushrooms Demystified by David Arora. 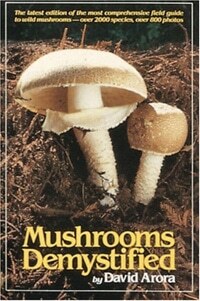 It is quite simply the best mushroom identification book ever written. So these are my top go-to foraging books, but I also keep around several older books for reference, such as the exhaustive Sturtevant’s Edible Plants of the World, and the extremely useful Edible Wild Plants by Oliver Perry Medsger. Both books are long out of print, and the links are to Amazon.com’s used book section. But if you look you can find them. Both are worth owning if you are a serious forager. While these are my favorites, I know there are tons of other wild edible plant books out there that are equally useful — and I’ve never met one that did not have at least a little value. What am I missing? Which books are your guides? Your recommended books posts are great. I find lists like this invaluable as a beginner of whatever subject Many Thanks! Have you considered doing one on hunting?